Jaroslav Filip received his MSc degree in environmental engineering at Tomas Bata University (Zlín, Czech Republic) in 2009 with diploma thesis aimed at biodegradation of biopolymer blends. 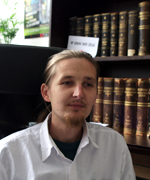 Currently, he is completing his PhD study in biotechnology with a focus on the application of nanomaterials in biofuel cells construction at Slovak Academy of Sciences, Institute of Chemistry (Bratislava, Slovakia). He authored 7 CC publications and 10 conference contributions with 7 citations so far. His current research field covers effective employment of different nanomaterials and biorecognition elements for a construction of biosensors and other biodevices. Šefčovičová J, Filip J, Gemeiner P, Vikartovská A, Pätoprstý V, Tkac J: High performance microbial 3-D bionanocomposite as a bioanode for a mediated biosensor device, Electrochemisry Communications 13, 966-968, 2011. Filip J, Šefčovičová J, Gemeiner P, Tkac J: Electrochemistry of bilirubin oxidase and its use in preparation of a low cost enzymatic biofuel cell based on a renewable composite binder chitosan, Electrochimica Acta 18, 366-374, 2013. Filip J, Šefčovičová J, Gemeiner P, Tkac J: Electrochemical Features of Bilirubin Oxidase Immobilized on Different Carbon Nanostructures, Key Engineering Materials 543, 13-17, 2013.